Wheelchair Kamikaze: Can A 100-Year-Old TB Vaccine Stop MS, Diabetes, and Other Diseases? Can A 100-Year-Old TB Vaccine Stop MS, Diabetes, and Other Diseases? If I told you that a century-old vaccine – initially developed to combat tuberculosis – now appears capable of stopping or slowing multiple sclerosis, type I diabetes, and other autoimmune diseases by changing the workings of the immune system at the genetic level, would you think I’ve finally gone off the deep end? Well, hold onto your hats, or hair, or whatever else may be sitting on top of your head because the truth is out there (yes, I’ve been binge-watching episodes of The X-Files), the ramifications of which could change the treatment landscape for many hideous diseases. I recently attended a presentation given to a group of neurologists and MS researchers by Dr. Denise Faustman (click here), a Harvard University medical researcher. Dr. Faustman is at the forefront of research into the Bacillus Calmette-Guerin (BCG) vaccine and in early trials has shown that the vaccine is capable of restoring dysfunctional parts of the immune system in patients with long-standing type I diabetes (click here). Dr. Faustman is currently conducting a phase 2 trial on long-term type I diabetics, with hopes of reporting results this summer. 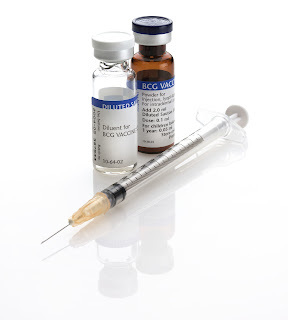 Other studies have shown that BCG can alter the course and severity of multiple sclerosis (click here), and ongoing studies around the world indicate that the vaccine could have similar effects on a wide range of autoimmune diseases (click here), including Sjogren’s disease, fibromyalgia (click here), and immune mediated allergies. The vaccine is also the preferred treatment for a common type of bladder cancer (click here) and there are indications that BCG may dramatically reduce the incidence of leukemia in children (click here). It is even effective as a treatment for leprosy (click here)! The BCG vaccine was developed at the beginning of the 20th century by two French scientists, Albert Calmette and Camille Guerin, work for which they were nominated for the Nobel Prize in 1928 (click here). Spurred in part by the observation that milkmaids appeared to develop tuberculosis in far lesser numbers than the general population, the two scientists developed the BCG vaccine using live but very weakened bovine (cow) tuberculosis bacteria, which makes cows sick but isn’t infectious in humans. The vaccine was first used in 1921 and although it ultimately proved to be only 20%-50% effective its use soon became widespread. It remains the only vaccine for TB and is still used extensively throughout Third World countries where TB runs rampant. The BCG vaccine is on the World Health Organization’s List of Essential Medicines. At that time of the vaccine’s development, tuberculosis was epidemic and deadly. In the 1800s, TB caused about 25% of all deaths in Europe (click here). The disease, commonly called “consumption” back in the day, is highly contagious and has been infecting mankind since antiquity. Signs of TB have been found in human skeletal remains dating back millennia, even into prehistory. Before the Industrial Revolution and the beginnings of modern medicine, folklore had it that tuberculosis was caused by vampires. My recent X-Files binge tells me not to completely discount this theory. Fast-forward to the 21st century, and modern scientists are discovering that the potential uses of the BCG vaccine go far beyond the treatment of TB. A phase 1 trial conducted by Harvard’s Dr. Denise Faustman, demonstrated that multiple injections of the vaccine given to patients with long-standing type I diabetes – an autoimmune disease – produce major changes in the immune system, restoring some back to normal, though a full cure and restoration of normal blood sugars has not yet been reported (click here). 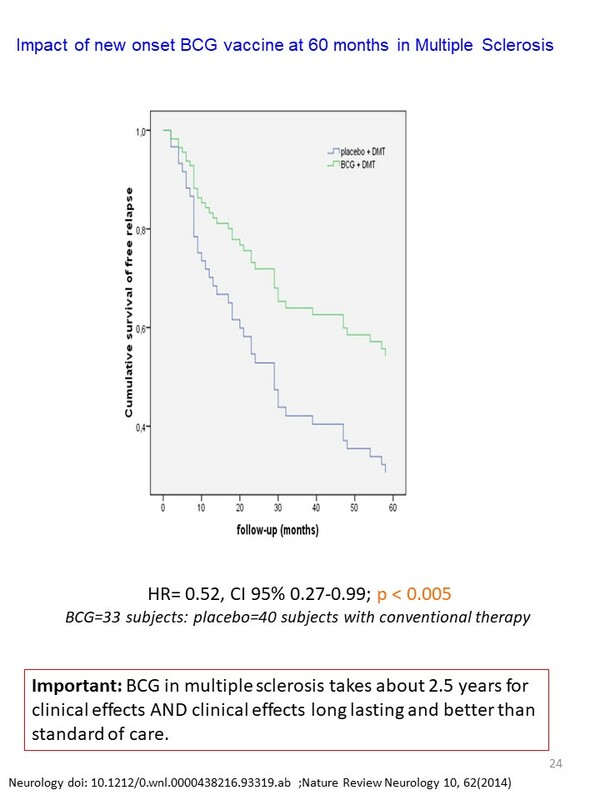 Italian researchers, using the same multiple BCG vaccination approach and the same potent strain of BCG, have demonstrated that patients given the vaccine after their first MS attack are up to 50% less likely to develop full-blown multiple sclerosis than similar patients not given BCG (click here), and that those who are eventually diagnosed with multiple sclerosis experience a more benign disease course. Click on the graphic to the left for a visual representation of BCG's effects on MS. Further studies are expected to explore whether aggressive treatment with BCG may temper or stop already established MS. 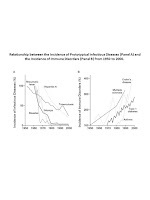 In addition, early studies indicate the vaccine can protect against allergic asthma (click here). 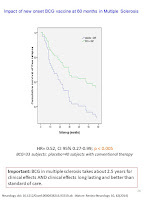 Retrospective studies have demonstrated that BCG may protect against a range of childhood cancers (click here). Other studies have shown that children infected with human tuberculosis bacteria before the age of seven have an extremely low incidence of developing multiple sclerosis (click here), hinting that the TB bug changes the immune system profoundly, and may impact a range of diseases. The above benefits, as significant as they are, may only scratch the surface of BCG’s potential. The vaccine appears to work by altering the workings of the immune system at the genetic level (click here). Because it works on the genes themselves, the effects of the vaccine are long-lasting, and the vaccine's effectiveness appears to increase with time. Thus, a set of two or three vaccinations with BCG may offer robust defense against a wide variety of the autoimmune diseases that are now becoming epidemic in developed nations. Tuberculosis is caused by a type of germ called mycobacteria (click here). The human immune system evolved in the presence of mycobacteria, which have been found in the bones of 70,000-year-old cave dwellers (click here). Over the last 40 or 50 years, though, as the developed world has become increasingly focused on hygiene and cleanliness, mycobacteria have been largely eliminated from the populations of First World nations. 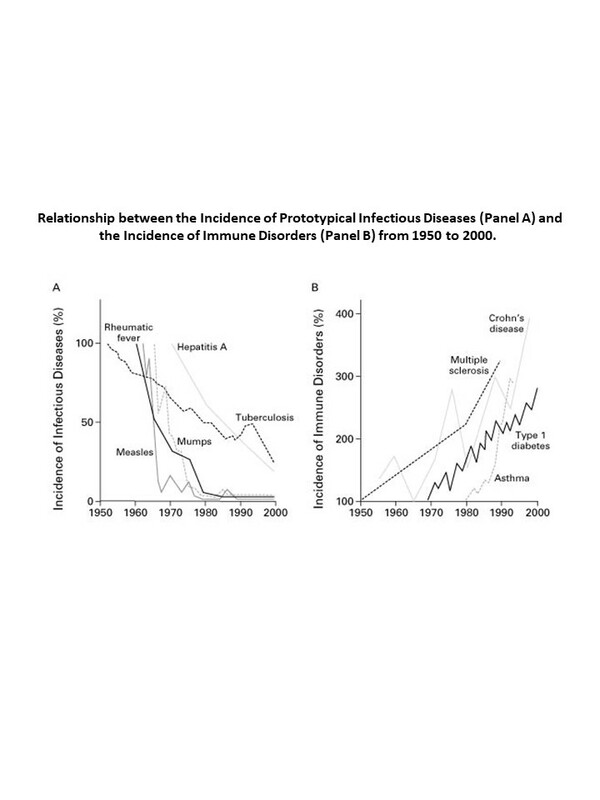 At the same time, autoimmune diseases and allergies have become epidemic in the same regions (see graphic to the right). The “old friends” or hygiene hypothesis (click here) suggests that the absence of the bugs that were our evolutionary companions has led our immune systems to go haywire. Think of it like this: one spouse in a long married couple that first met in grade school suddenly exits the relationship. The remaining spouse is confused, disoriented, and likely to behave in unpredictable and perhaps self-destructive ways. According to the old friends hypothesis, this sort of disorientation in the immune system is driving a startling rise in diseases such as MS, lupus, diabetes, and fibromyalgia, all of which were much rarer even just 50 or 60 years ago when mycobacteria infections in humans were still common worldwide. Since BCG reintroduces mycobacteria into the body, it may help restore balance to immune systems that evolved with constant exposure to such bacteria. Unfortunately, a variety of factors are hampering research into the benefits of BCG. Modern studies exploring the use of the vaccine to combat autoimmune and other diseases are still in their early stages, and many questions remain. The vaccine is manufactured using live but inactive bacteria, meaning its potency varies depending on the manufacturing facility. In her type I diabetes studies, Dr. Faustman uses a very potent version of the vaccine manufactured in Japan which is not available in North America. In fact, BCG isn’t available anywhere in North America, as the last BCG factory in the region stopped production in 2016, due to manufacturing issues and the low profit potential of the drug (click here). Additionally, queries regarding the number of vaccinations needed for full potency as well as the most optimal methods of safely introducing BCG into the human body are still to be answered. The most significant impediment to the development of BCG as a therapy for autoimmune and other diseases, though, is a severe lack of funding. Since the drug is nearly a century old and quite cheap (single doses cost pennies in Third World nations) there is very little to incentivize the for-profit medical establishment to get behind the research. The reasons for this are myriad, but boil down to the obscene fact that all too often profits take precedence over patients in our current twisted model of medical research, which is more often propelled by the drive for ever-increasing revenues than by scientific imperative. Many potentially paradigm-shifting therapies like BCG have been left to die on the vine simply because they lack blockbuster profit potential. MS and diabetes have become mega industries generating yearly revenues of $25 billion each, creating a status quo that discourages disruptive innovation. We can’t kill the geese that lay the golden eggs, now, can we? Research into the BCG vaccine holds tremendous possibilities for fundamentally changing the treatment landscape for a wide variety of terrible diseases that are being seen with dramatically increasing frequency, including multiple sclerosis. In a perfect world, or even a less imperfect one, massive resources would be devoted to investigating BCG and other treatments that hold great promise but little profit potential. Instead, innovative researchers like Dr. Faustman and her colleagues are left to work in the shadows while a seemingly never-ending stream of “me too” drugs are brought to market, fueling massive industries devoted to treating diseases, not curing them. If only a fraction of the monies spent developing blockbuster drugs that keep patients perpetually dependent upon them were dedicated instead to seeking cures or researching innovative therapies like the BCG vaccine, modern medicine and the patients who find themselves stuck in the belly of the beast would be much better served. As they say in the X-Files, the truth IS out there. And it may just be hiding in plain sight. Hi - I have given up hoping for any type of cure. Every once in a while, I squawk about big pharma & the cost of drugs that (for me) don't work. Now my latest brainstorm is someone of "value" being diagnosed w/ MS, which will actually generate quicker/aggressive research. Granted, I wouldn't wish MS on anyone, but the number of people being diagnosed is rapidly growing, so anything is possible. We'd need a real star, like Beyonce or Bruno Mars....I also envision MS only care facilities (READ: nursing homes) so us poor slobs that can't move but still have our dogs barking aren't locked up w/ elderly, dementia patients. GEEZ - I wish someone would throw us a bone! Marc, I love reading your blog, but hearing you tell your story was so edifying. Your voice and expression told so much more than just your written words. I will keep hoping that the "holy grail" will be discovered, but my then 14 year old grandson's words echo in my head...."Yia, there are some things we are not meant to know". Unfortunately, only the Connaught strain of the BCG vaccine seems to have the desired immunoregulatory effects and it has been discontinued by Sanofi a few years now. The TICE strain that is available does not demonstrate equally possitive results in trials. This sounds wonderful. Problem is --- the BCG vaccine has been routine in many parts of the world!